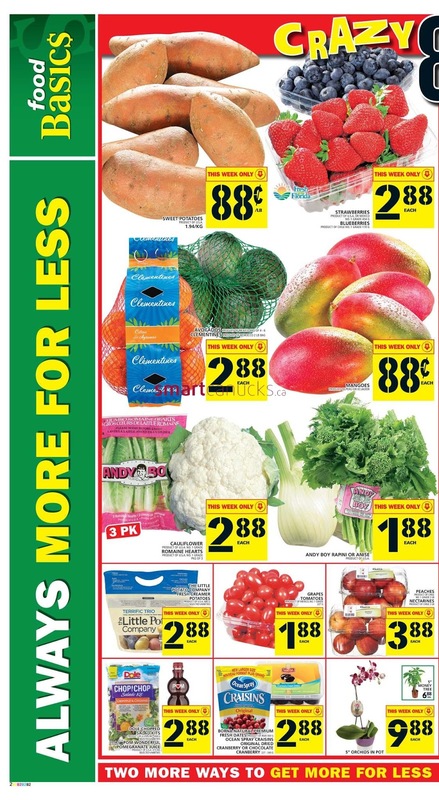 Food Basics Canada Flyer January 25 - 31, 2018 - Seedless Navel Oranges, Royal Gala Apples $0.68/lb Sale Price Seedless navel oranges product of Spain or U.S.A. royal gala apples extra fancy grade $1.50/kg. Philadelphia or Cream Cheese Kraft Singles or Cheez Whiz $2.88 Sale Price Philadelphia or cream cheese 227-250 g kraft singles or cheez whiz 450 g selected varieties. Wonderful Roasted Pistachios $3.88 Sale Price Product of U.S.A. 225 g selected varieties. Strawberries or Blueberries $2.88 Sale Price Strawberries product of U.S.A. or Mexico no. 1 grade 454 g blueberries product of Chile no. 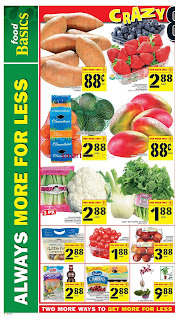 1 grade 170 g.
Food Basics Canada Flyer Avocados, Clementines $2.88 Sale Price Avocados product of Mexico bag of 4 - 6. Clementines product of morocco 2 lb bag. Dole Chopped Salad Kits or Pom Wonderful Pomegranate Juice $2.88 Sale Price Dole chopped salad kits product of U.S.A. 198 - 408 g selected varieties pom wonderful pomegranate juice product of U.S.A. 473 ml selected varieties. Cauliflower Romaine Hearts $2.88 Sale Price Cauliflower product of U.S.A. no. 1 grade romaine hearts product of U.S.A. no. 1 grade pkg of 2. Top Sirloin Roast or Family Pack Steaks $6.88/lb Sale Price Cut from canada aa or higher grades of beef $15.17/kg. Sirloin Tip Roast or Family Pack Steaks $5.88/lb Sale Price Cut from canada aa or higher grades of beef $12.96/kg. Red or Green Seedless Grapes $1.88/lb Sale Price Red or green seedless grapes $4.14/kg. High Liner Family Pack $3.88 Sale Price 350 - 700 g frozen selected varieties. 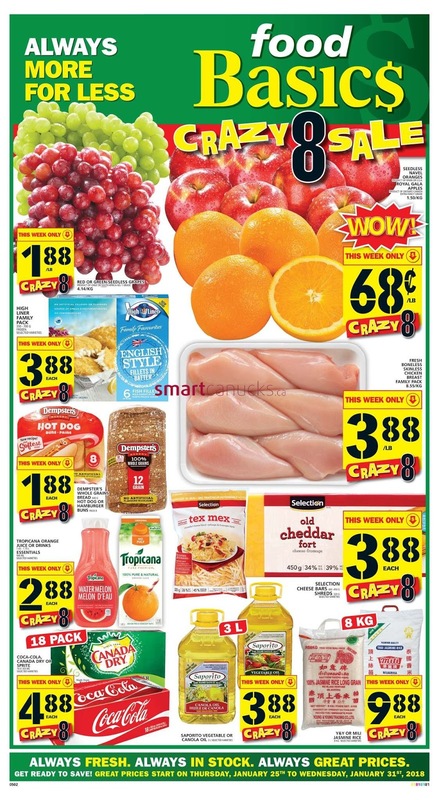 Food Basics Flyer Coca-Cola, Canada Dry or Sprite $4.88 Sale Price 18 x 355 ml selected varieties. Selection Cheese Bars or Shreds $3.88 Sale Price Selection cheese bars 400-450 g or shreds 320 g selected varieties. 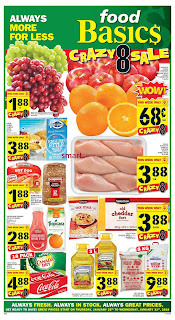 Fresh Boneless Skinless Chicken Breast Family Pack $3.88/lb Sale Price $3.88/lb. $8.55/kg. General Mills Honey Nut Cheerios or Reese Puffs or Golden Grahams $1.88 Sale Price General mills honey nut cheerios 330 g while quantities last reese puffs 365 g golden grahams 340 g selected varieties. G.H. Cretors, Terra or Skinny Pop Snacks $2.88 Sale Price 125 - 213 g selected varieties. Planters Dry Roasted Peanuts, Almonds or Cashews $3.88 Sale Price 200 - 454 g selected varieties.